Leaving San Jose at the not-so-early hour of 9a, I was heading to the Trinity Alps for a 4 day trip, to be joined for several days by Matthew. I had planned an easy half day outing to Tylers Peak, a P1K not quite reaching to 5,000ft. The problem I was to find through the wonder that is weather forecasting is that a heatwave was covering much of the state including Trinity County. Temperatures were expected to be in the mid-90s by the time I got to the start, something I could hardly get excited about. I began to think of Gibson Peak, a much more impressive P1K (also on the CC-list) that rises to more than 8,000ft. Surely that would be cooler, but the question was whether I could do it starting so late in the afternoon. As I was driving north on Interstate 5 I was doing some mental math about the outing, concluding if I started by 2p I could surely finish before dark. An hour later I concluded I could never get to the trailhead by that time, but if I got there by 3p I could probably still finish before dark. I knew there would be snow and I'd probably need crampons and axe in the upper part of the mountain - something not to be done in failing light. Driving west on SR299 hours later I realized I'd never make it to the TH by 3p, but if I could get back down from the summit and to the trail before dark I could walk the remaining distance easily by headlamp. And so my thinking went in convincing me to do Gibson, regardless of when I actually started. A day earlier I would never have even considered it, but here I was starting out from the Swift Creek TH at 3:30p heading for Gibson Peak. It was a brilliant decision in hindsight, with several advantages that I might not have realized starting at a more usual time. For one, the day was past the hottest time and it was starting to cool down soon after I set off. I hiked up the Swift Creek Trail, turning off to the Granite Lake Trail after the first mile, crossing Swift Creek on a fine bridge and heading up through forest and meadow in brilliant green colors of spring. Gibson Peak came into view sometime before 5p and I could see by the amount of snow still on the northern aspects that I'd get a chance to use the axe and crampons I carried. I followed the trail to Granite Lake and through a campsite located there before starting off cross-country. A use trail led part-way around the west side of Granite Lake but soon devolved into mild bushwhacking and some rock scrambling to get me around the brush-free slopes closer to Gibson (the descent route I used was much better, with no serious bushwhacking at all). 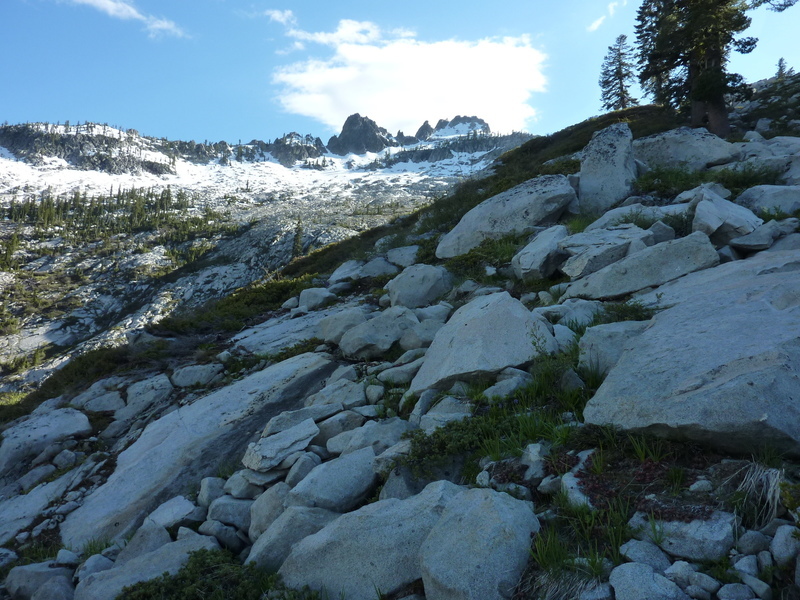 Once clear of the major brush, I began an ascending traverse up steep slopes through boulders and mildly-vegetated slopes, scrambling above Granite Lake to opening views. As I climbed higher the ground became wetter with rivulets of water braiding down from the melting snows above. It was hard to find dry ground anywhere after awhile. I was lucky to be sporting a newer pair of boots that did not absorb water as quickly as my older ones would have, and for the most part my feet stayed fairly dry. It was after 6p when I reached the snowline, where uphill travel was no longer possible over talus and boulders. Here I put on gaiter and crampons and got out my axe as the angle of the Northeast Face continued to increase. I also discovered a new benefit of my late start - the sun had already ducked behind the North Ridge, leaving the snow section completely in shadow and obviating the need for sunscreen or eye protection. The snow was decently firm too, taking good step kicks on the steepest sections with almost no postholing at all. My route up followed as high as I could get while still on snow, with a last short couloir that brought me to the crest only a few minutes from the top. It was nearly 7p when I stood at the summit, looking over a landscape steeped in shadow of the waning afternoon. It was a glorious sight to behold, only the slightest of breezes and a most comfortable temperature. I took a few minutes to photograph more than 50 pages of a register that dated only to 2004. Clearly this was a popular summit. After soaking in more of the views and identifying some of the major summits that I recognized, I headed back down the same way, reversing my route through the snow and wet sections of the Northeast Face. I stayed higher above the west side of Granite Lake, hugging the base of the east side of Gibson's North Ridge as it bends to the northeast and descends towards the trail. This got me above and around the brush on the west side of the lake and back to the trail around 8p. I made it back to the Swift Creek bridge by 9p, at which time I dug out my headlamp for the last mile back to the TH.